A unique codex Codex A textual form made of bound leaves. Commonly known as a book. See: Interleaf CLOSE or ESC technology, the volvelle consists of one or more layers of parchment Parchment the hide of a sheep or goat prepared for being written or printed upon. See: Substrate Vellum CLOSE or ESC or paper Paper a surface for writing or printing made out of pulped cotton, linen or wood. See: Substrate Pop-up CLOSE or ESC discs and shapes fastened to a leaf Leaf the sheet of paper or parchment with one page on its front side (recto) and another on its back (verso). See: Recto Verso Page CLOSE or ESC, allowing for each individual layer to be rotated independently of the other components. The volvelle allows the reader to perform calculations or discover additional information through the rotation of the pieces, which work in conjunction with an illustrated base printed directly on the leaf. Generally, the parts bear text or illustrations and are anchored to the page Page one side of a leaf. See: Recto Leaf Verso Paginae PDF CLOSE or ESC with string; some volvelles include a decorative cap fastened with glue to cover the knot on the reverse page. The name derives from the Latin volvere, meaning "to turn," and variant names include wheel charts, information wheels, and rundells. The volvelle first appeared in thirteenth-century England, but gained prominence in Germany to become one of the earliest known examples of a movable book part. Its ingenuity allowed for greater interaction between reader and text, conveying information through a more dynamic delivery system. 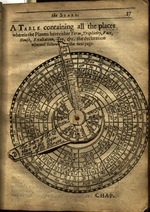 Some of the earliest examples of volvelles were tools for divination that sought answers to questions concerning creation, faith, or the nature of the world, often through the application of tenets of Christianity combined with elements of the occult.1 The application of volvelles in the sciences began in the fifteenth century, where they were used to perform calculations for a variety of purposes. Some Renaissance scholars have argued that the book is an artifact that embodies the foundational characteristics of computer technology, describing the elements of books in relation to databases, search engines, computer memory, and archives.2 Volvelles in particular have been called "astronomical computers"3 due to their ability to perform basic computational exercises such as calculating astronomical phenomena, as evidenced by Peter Apian’s Cosmographia (1524) and the extraordinary Astronomicum Caesarium (1540). Similarly, volvelles were also employed as navigational tools, which proved exceedingly popular, giving rise to a new genre, the mariner’s handbook. With the coming of the Industrial Revolution, the greatly lowered cost of printing fostered innovative book designs involving movable features. Book producers in the late nineteenth century focused on children’s literature with an eye to its entertainment value, and the era saw a remarkable surge in the number of books containing pop-ups and other movable designs that have their origins in the volvelle. During the twentieth century the volvelle began to be manufactured as a separate product, independent of the book, but was still able to incorporate historical applications such as pedagogical tool, advertising supplement, calculator, and toy or game. 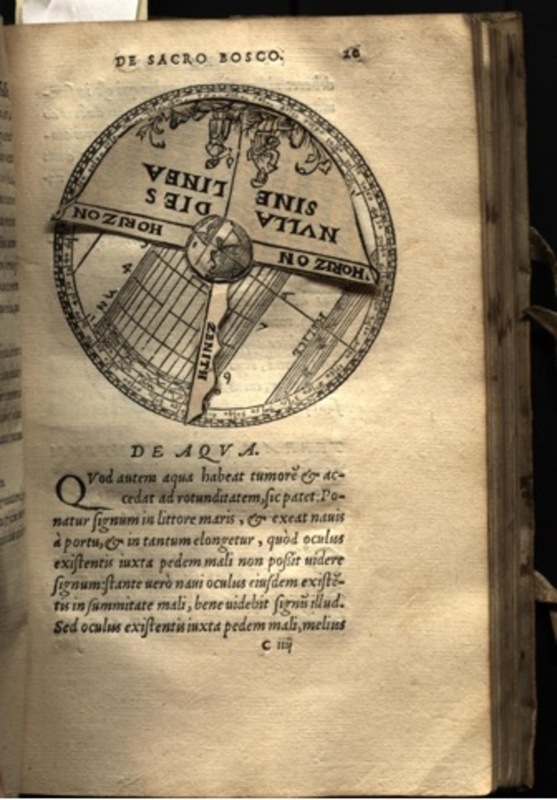 The volvelle has transitioned into the digital age in the form of computer applications and online tools, and continues to enable a rich variety of textual interactions. 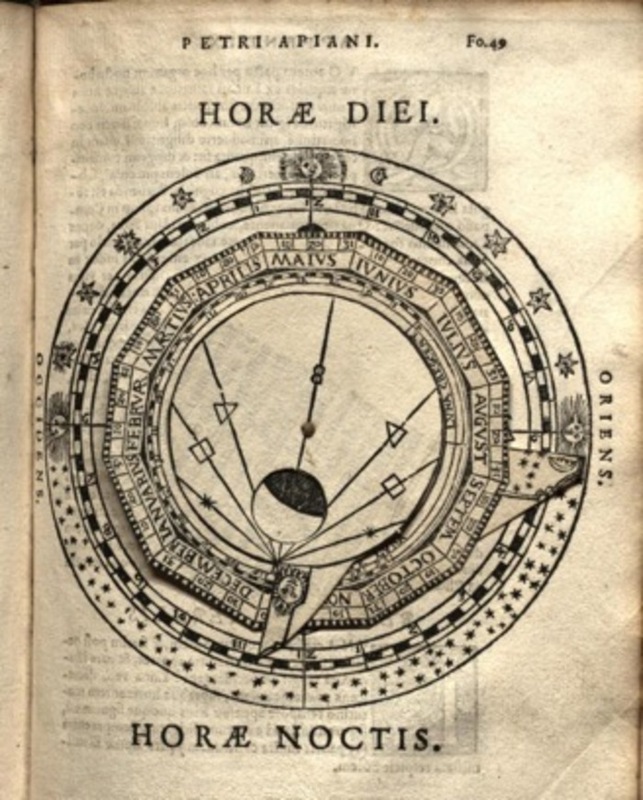 A notable example of an early astronomical volvelle is found in Johannes Sacrobosco’s Sphaera (fig. 1), an early astronomy text dating back to the thirteenth century. 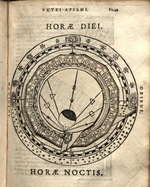 Sphaera became a popular elementary astronomical textbook around the late fifteenth century, but it was not until 1538 that Joseph Clug, a Wittenberg publisher, introduced three volvelles into the text.15 Reflecting contemporary notions of astronomy, Sacrobosco’s books were based in the Ptolemaic theory of cosmology, which credited the movement of the planets to approximately eighty epicycles, or circles. These epicycles intersected with larger concentric circles surrounding the earth and were used to explain the orbit of planets. The complexity of Ptolemaic theory required intricate instruments for calculation, and the rotational aspect of volvelles and the accuracy they could achieve made them well-suited to this task; astronomical calculations, mathematical equations, and navigational measurements could be completed with exactitude.16 For this reason, volvelles found a place in a wide range of scientific books. By the nineteenth century volvelles were no longer reserved for scholarly publications. 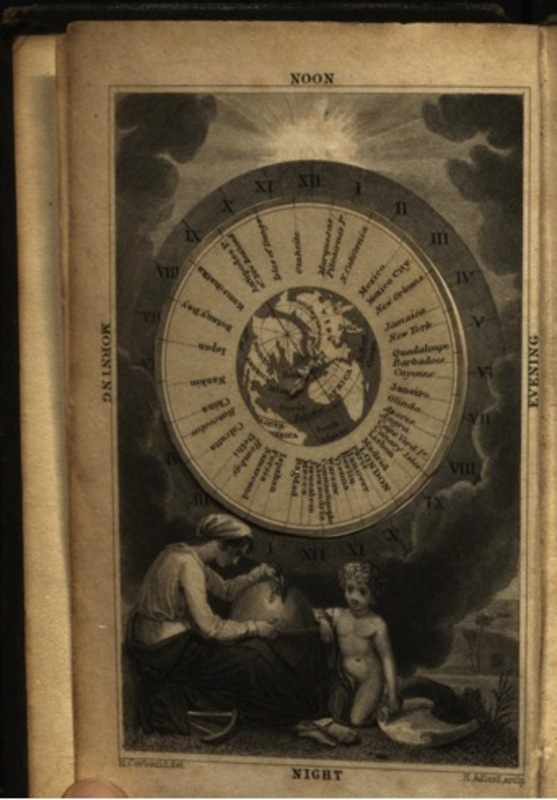 For instance, A Comprehensive Grammar of Modern Geography and History by William Pinnock, a nineteenth-century textbook, contains a volvelle opposite its title page (see fig. 4). This rather simple volvelle is made of a single disc depicting the globe with the names of major cities around its circumference. Behind the disc on the leaf is a set of twenty-four sections, representing hours, laid out in a circular orientation. Readers could use this volvelle to determine the time in different parts of the world. This particular volvelle is much more accessible than the previous examples; it is straightforward and the accompanying illustration depicting a woman and child makes its use seem less formidable. Clearly not meant to be a precise and complex tool, Pinnock’s time-zone wheel still relies on reader input to create meaning, but it does not demand the complex analysis and interpretation associated with early volvelles. As books became more accessible in terms of their physical procurement, they also became more accessible in terms of their content. During the Victorian era illustrated books became significantly more popular. The purpose of such texts was to entertain, rather than solely to inform.29 An emerging middle class created a greater market for literature designed specifically for children; parents preferred books to magazines because books were substantial, while magazines were seen as frivolous and transient.30 Because of this great demand for children’s literature, book publishers were able to invest more in creating fanciful works for children; publishers of movable books experimented in fresh and novel ways by pushing the boundaries of technology and the tastes of the market.31 Victorian-era children’s books often contained lavish illustrations and an abundant number of volvelles.32 Although the cost of printing a book had been greatly reduced, volvelles were still an expensive feature to add and their prevalence in children’s literature, where there was usually no pedagogical purpose, demonstrates that entertainment was becoming a legitimate use for such features. For example, Clifton Bingham wrote several books of verse for the publisher Ernest Nister in the 1890s and early 1900s, including Something New for Little Folk and Magic Moments. Many of these books had revolving pictures, which contained multiple images printed on slit-discs that overlapped. When turned, they created the impression that the image was transforming; the overall effect was similar to animation. These enchanting movable books, however, did not endure the test of time due to the disruptions experienced by European publishers during the First World War, the inherent complexities of movable production, and increasing costs of publishing combined with a juvenile market that demanded low costs. The ephemeral nature of children's movable books has only served to increase their value among collectors,33 and although pop-up books still exist today, they are not seen in the same abundance, nor are they generally as intricately made as those of the Victorian era. In the twentieth century, the volvelle evolved into the free-standing wheel chart. Often used both as an interactive tool and as an advertising supplement, contemporary examples of these kinds of paper ephemera range from fortune-telling wheels to measurement conversion tools. Present-day volvelles are often associated with popular culture, such as the record sleeve for Led Zeppelin’s 1970 Led Zeppelin III, which features a die-cut disc that when spun reveals a variety of images. Alternatively, artists such as Karen Bleitz have elected to maintain the connection between books and volvelles. Her art books contain wheels and levers that allow the reader to interact with the text in ways reminiscent of early volvelles (see some of her work here). In his essay “Mobiles in Books,” Sten G. Lindberg notes that “at certain periods movable parts in books belonged to the generally accepted means of expression in book production. They represent many interesting pedagogical attempts which could be called ‘long before their time’ if it were not that they have left our time far behind them.”34 Interaction is a key feature of volvelles, and in some ways foreshadows the interfaces found in our current digital society. The factor that distinguishes digital visualization from printed illustrations is their interactivity, as they allow the “manipulation of both the graphical representation and the data it is derived from.”35 In essence, digital visualization and wheel charts strive towards the same goal, making the volvelle easily adaptable to the digital landscape. Volvelles represent opportunities for textual encounters on multiple levels. Scholars theorize that early printed volvelles were intended to be constructed by someone other than the printer or publisher, effectively blurring the boundaries between the creator(s) of a publication and those who engage with the text.37 While all textual interactions may be considered performative, the requirement of the reader to construct a volvelle in order to actually use it can be interpreted as an act of authorial control. It is the reader who has a definitive command over the construction of the text; however, this may result in the volvelle being assembled incorrectly,	thus rendering the technology useless. Therefore, the notion of a typical relationship (if one can say that such a thing exists) among author, reader, and text, must be reconsidered when examining vovelles. The text is no longer a complete and static entity that the reader receives from the author; instead the text is the result of a collaborative process in which the author or publisher supplies the materials and the reader builds the device. There was a pedagogical intention behind volvelles; 38 rather than remain bound within the confines of a narrative structure, volvelles created a new educational strategy where the learning outcomes were best met by representing data and ideas in a more dynamic format. Volvelles can be said to typify the concept of Robert Hooke’s “operational knowledge,” published in Micrographia in 1665. As James Bennett notes, for Hooke and his contemporaries “the conduct of the new natural philosophy should involve experimental practice, instrumental deployment, mathematical formalism, and mechanical explanation. It was presented as a turning away from bookish learning to the manipulation of real things, from imagination to operation.”39 Volvelles are unique in this respect because although they remain in the domain of the book, information is presented in a manner unlike any other codex technology. This corporeal engagement allows for textuality that bridges the divide between theoretical and practical knowledge. Considering that codices such as Cosmographia and Ars Magna consist of textblocks, labels, illustrations, and movable parts, they can be deemed multimodal because they allow the reader to interact with the information using multiple approaches, such as viewing, reading, scanning, and manipulating. Owen Gingrich argues that volvelles avoided ambiguity and provided an immediacy of understanding that functioned well with scientific theories and facts, yet recognizes that “while ostensibly providing an ordered framework for the experience of linguistic meaning, the visual also acts to disrupt any linear unitary response by providing fissures in that smooth progress.”40 A number of textual elements have the potential to disrupt a reader’s response, from the basic unit of words separated by white space, to the detachment of text on a verso to that of its recto, or larger still, the chasm that exists between the reader and the text. Readers are habituated to these types of textual discontinuities; they are not necessarily obstacles to overcome. Volvelles offered an innovative approach to interacting with data, which an early modern reader may have viewed as singular in its capacity for knowledge creation. Further, volvelles embodied the essence of engagement as the process of using, and, in some cases, building, the technology was driven by the reader’s actions. Volvelles illustrate that creators and readers of text are not limited to what is printed or fixed to a page. For contemporary readers, digital texts also offer such interactivity by enabling the format or content of a text to be altered based on user inputs or commands, which reflect the needs and preferences of individuals. The relationships among author, text, and reader continue to be renegotiated as new technologies create new textual opportunities. 1 The word “occult” is used here in the traditional sense, meaning hidden or secret knowledge, rather than the contemporary sense, which is often used as a synonym for the paranormal. 2 Neil Rhodes and Jonathan Sawday, "Paperworlds: Imagining the Renaissance Computer," in The Renaissance Computer: Knowledge Technology in the First Age of Print (London: Routledge, 2001), 1-17. 3 Nick Kanas, "Volvelles! Early Paper Astronomical Computers," Mercury 34.2 (2005): abstract. 4 Sten G. Lindberg, "Mobiles in Books: Volvelles, Inserts, Pyramids, Divinations, and Children's Games," trans. William S. Mitchell, The Private Library, 3rd series, 2.2 (Summer 1979), 49. 5 Daniel K. Connolly, "Imagined Pilgrimage in the Itinerary Maps of Matthew Paris," The Art Bulletin, 81.4 (December 1999) http://www.jstor.org/stable/3051336, 611. 6 Ibid. 7 Ibid. 8 Suzanne Karr Schmidt, "Constructions Both Sacred and Profane: Serpents, Angels, and Pointing Fingers in Renaissance Books with Moving Parts," The Yale University Library Gazette 78, no. 3/4 (2004): 101-27. https://www.jstor.org/stable/40859568, 1. 9 Lindberg, "Mobiles in Books," 50-51. 10 Schmidt, "Constructions Both Sacred and Profane," 1. 11 Lindberg, "Mobiles in Books," 50. 12 Schmidt, "Constructions Both Sacred and Profane," 2. 13 Lindberg, "Mobiles in Books," 53. 14 Ibid. 54. 15 Owen Gingerich, "Early Astronomical Books with Moving Parts," in A History of Book Illustration: 29 Points of View, ed. Bill Katz, (London: Scarecrow Press, 1994), 289. 16 Jessica Helfand, Reinventing the Wheel (New York: Princeton Architectural Press, 2002), 19. 17 Ibid. 22. 18 Gingerich, "Early Astronomical Books," 289; Richard Cunningham, "Coincidental Technologies: Moving Parts in Early Books and Printed Hypertext," Digital Studies 0.12 (2009), https://www.digitalstudies.org/articles/10.16995/dscn.128/; "A Lunar Clock," Museum of the History of Science, Oxford, http://www.mhs.ox.ac.uk/students/98to99/Inst/Instpgs/8.tinyVOLVELLEhoraeDiei.html. 19 Cunningham, "Coincidental Technologies." 20 "A Lunar Clock," Museum of the History of Science, Oxford, http://www.mhs.ox.ac.uk/students/98to99/Inst/Instpgs/8.tinyVOLVELLEhoraeDiei.html. 21 Gingerich, "Early Astronimical Books," 293. 22 Helfand, Reinventing the Wheel, 21. 23 Gingerich, "Early Astronomical Books," 294. 24 Raleigh Ashlin Skelton, Introduction to The Mariner's Mirror: London 1588, by Lucas Jansz Waghenaer (Amsterdam: Theatrum Orbus Terrarum, 1966), v. 25 Lindberg, "Mobiles in Books," 70. 26 Lucas Jansz Waghenaer, The Mariner's Mirror: London 1588 (Amsterdam: Theatrum Orbus Terrarum, 1966), 29. 27 Lindberg, "Mobiles in Books," 30. 28 Ibid., 67. 29 Patricia Demers, ed., From Instruction to Delight: An Anthology of Children's Literature to 1850 (Oxford: Oxford University Press, 2008), xiii. 30 David Finkelstein and Alistair McCleery, An Introduction to Book History (New York: Routledge: 2005), 114. 31 Leslie A. McGrath, This Magical Book: Movable Books for Children, 1771-2001 (Toronto: Coach House Press, 2002), 8. 32 Ibid., 24-26. 33 Peter Haining, Movable Books: An Illustrated History (London: New English Library, 1979), 9. 34 Lindberg, "Mobiles in Books," 50. 35 Martyn Jessop. "Digital Visualization as a Scholarly Activity," Literary and Linguistic Computing 23, no. 3 (2008): 281-293: 283. 36 Ibid. 282. 37 Cunningham, "Coincidental Technologies"; Gingerich, "Early Astronimical Books," 289. 38 Cunningham, "Coincidental Technologies." 39 James A. Bennett, "Practical Geometry and Operative Knowledge," Configurations 6.2 (1998): 220. 40 Gingerich, "Early Astronomical Books," 173. Bennett, James A. "Practical Geometry and Operative Knowledge." Configurations 6.2 (1998): 195-222. Connolly, Daniel K. "Imagined Pilgrimage in the Itinerary Maps of Matthew Paris." The Art Bulletin, 81.4 (Dec., 1999): 598-622. http://www.jstor.org/stable/3051336. Cunningham, Richard. "Coincidental Technologies: Moving Parts in Early Books and Printed Hypertext." Digital Studies 0.12 (2009), https://www.digitalstudies.org/articles/10.16995/dscn.128/. Demers, Patricia, ed. From Instruction to Delight: An Anthology of Children's Literature to 1850. Oxford: Oxford University Press, 2008. Finkelstein, David, and Alistair McCleery. An Introduction to Book History. New York: Routledge, 2005. Gingerich, Owen. "Early Astronomical Books with Moving Parts." In A History of Book Illustration: 29 Points of View. edited by Bill Katz, 288-296. London: Scarecrow Press, 1994. Haining, Peter. Movable Books: An Illustrated History. London: New English Library, 1979. Helfand, Jessica. Reinventing the Wheel. New York: Princeton Architectural Press, 2002. Kanas, Nick. "Volvelles! Early Paper Astronomical Computers." Mercury 34.2 (2005): 33-39. Lindberg, Sten G. "Mobiles in Books: Volvelles, Inserts, Pyramids, Divinations, and Children's Games." Translated by William S. Mitchell. The Private Library, 3rd series, 2.2 (Summer 1979): 49-82. McGrath, Leslie A. This Magical Book: Movable Books for Children, 1771-2001. Toronto: Coach House Press, 2002. Museum of the History of Science, Oxford. "A Lunar Clock." http://www.mhs.ox.ac.uk/students/98to99/Inst/Instpgs/8.tinyVOLVELLEhoraeDiei.html. Rhodes, Neil and Jonathan Sawday. "Paperworlds: Imagining the Renaissance Computer," in The Renaissance Computer: Knowledge Technology in the First Age of Print, 1-17. London: Routledge, 2001. Schmidt, Suzanne Karr. "Constructions both Sacred and Profane: Serpents, Angels, and Pointing Fingers in Renaissance Books with Moving Parts." The Yale University Library Gazette 78, no. 3/4 (2004): 101-27. Available at https://www.jstor.org/stable/40859568. Skelton, Raleigh Ashlin. Introduction to The Mariner's Mirrour: London, 1588, by Lucas Jansz Waghenaer, v-xi. Amsterdam: Theatrum Orbis Terrarum, 1966. Waghenaer, Lucas Jansz. The Mariner's Mirrour: London, 1588. Amsterdam: Theatrum Orbis Terrarum, 1966.